Celebrate Mother’s Day this Sunday, May 11, with a photo of your mom on Twitter and Instagram! Every Monday on Instagram, we celebrate mothers of sponsored children and their efforts to create a better life for their families. Our #MotherMonday hashtag game shows the faces of mothers around the world, and we want you to add to our collage. Post a photo of your mom or a photo of you with your mom, tag @Unboundorg and use the hashtag #MotherMonday. Esther and baby Alex from Kenya. Esther’s older son Samuel is sponsored through Unbound. Ann and her daughter Sophia, an Unbound sponsored youth, are part of the Maasai tribe in Kenya. The Masssai are known for their beautiful artisan beadwork. Here we have Graciela and her two daughters, Gloria, left, and Viviana. Both girls are sponsored through Unbound in Colombia. Maria Luisa, center, and her adorable children outside their home in Bolivia. Looks like she’s got her hands full! From left: Cecilia helps her daughters Karol and Karen with their homework. The girls are part of the Unbound sponsorship program in Colombia. Berta holds her daughter, Idalia, in one arm and “ensarta” in the other. Ensarta is the thread of fishes. The main way to create income in Berta’s area of El Salvador is through fishing and other activities from the lake. This is Estela and two of her 10 children, Edwin and baby Carlos, in Guatemala. So cute! “I am proud of my children because they are good children and they are good students,” Estela said. This is Meena with her daughter Kushi. Meena is part of an Unbound mothers group in India. She purchased the sewing machine with a microloan provided by the group. Here we have Olga and Marvin and their little boy, Anderson, in El Salvador. While Marvin works as a bricklayer, Olga stays at home with Anderson and also breeds and sells chickens to add to the family’s income. What a hard-working family! Elizabeth (second from right) is part of an Unbound mothers group in Kenya. She took out a loan from her group and now runs a successful poultry business with her husband and two sons. Way to go, Elizabeth! From left: This is Maria and her two daughters, Emili and Lizbeth, who live in El Salvador. Maria stays home with the girls while her husband works hard in the fields to provide an income for the family. Meet Wendy and her son Carlos, who live in El Salvador. Wendy is a hard-working, single mom who takes care of Carlos and her younger son, Byron, who has cerebral palsy and needs special care. Along with taking care of her boys, Wendy makes and sells traditional Salvadoran treats to earn extra income for the family. Meet Anita and her son, Abhishek, who is sponsored through Unbound. This family lives in India where Anita is a housewife and takes care of her three young children. Meet Maria Auxiliadora and her two daughter’s Maria Isabel and Kathiela Vanessa! This family lives in Nicaragua where Maria is a housewife and she is also in the “Blessings from God” mothers group where they prepare and sell nakatamales. Her husband, Juan, is a hard-working truck loader. They are a humble family. Visiting sponsored members’ homes is one of the highlights of an Unbound Awareness Trip. On a recent trip to Nicaragua, sponsors were treated to a special musical performance at one home. Photo credits for this report go to Ricardo Ajpuac and Gerver Churunel, CFCA-Guatemala staffers, the CFCA staff in Managua and Bob Hentzen. Mayela, CFCA social worker in Nicaragua. Mayela at a monthly meeting with parents of sponsored children. Bismark reviews sponsored friends’ cards on their way to sponsors. Bismark was promoted from a correspondence specialist to a CFCA accountant. When CFCA scholars graduate from the program, what happens next? For many former scholarship students, their new career may be right where they started. 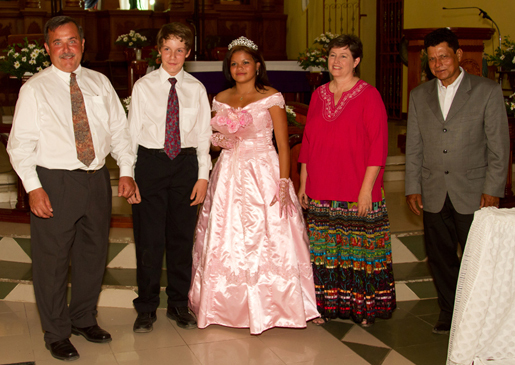 Read the personal success stories of Bismark and Mayela in Nicaragua. It’s a joy to share with you the beautiful people of Nicaragua. With a population of more than 5 million, statisticians rate Nicaragua as the largest in geographical size and economically poorest of Central America. It is popularly known as the land of volcanoes, poets, artists and good baseball, but let’s add beautiful harmonies and colorful dances to that list. 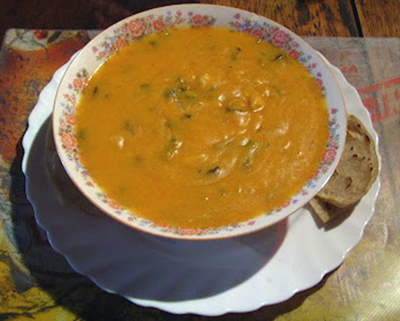 Try this indio viejo recipe from Nicaragua … mmm! Unbound serves more than 10,000 sponsored children and elderly in Nicaragua. Our staff members there sent us this tasty recipe for “indio viejo,” or a corn-based, slow-cooked stew! The Nicaraguan people are experts at making a variety of food dishes based on corn. This is a culture inherited from their ancestors. In rural communities, corn-based meals are consumed daily. One of them is indio viejo, which is usually served as the main dish with rice, fried plantain and coleslaw salad. Sometimes, however, it is served as a secondary dish. From left are Harvey Correia; his son, Michael; Claudia, the Correias' sponsored child; Linda, Harvey's wife; and Timoteo, Claudia's father. This picture was taken at Claudia's quinceañera. Last week Harvey Correia wrote a beautiful blog post about his family’s first mission awareness trip to Nicaragua, where they met their sponsored child, Claudia, and also sponsored two more children: Juan Francisco and Neyling. Here he recounts the story of how Claudia and her “family” from the U.S. got to celebrate her quinceaÒera,the celebration of a girl’s 15th birthday and transition into adulthood. We enjoyed visiting Claudia so much in 2009 that we returned on a mission awareness trip the following August so we could visit all three of our sponsored children. We visited Claudiaís home on this trip and met her mother, a sister and a brother. Unfortunately, we learned that her father was quite ill and had been unable to work for nearly a year because of his ailments. This obviously brought sad feelings, but we also had some new joys by seeing our children bond together while we traveled with CFCA for the next few days. We treasure a photo of Claudia walking with her arm around Neylingís mother. During this trip we met a fellow sponsor, and through him we met more sponsors through Facebook contacts. One of these contacts had photos of a quinceaÒera celebration for their sponsored girl from Nicaragua, and we decided to pursue helping our girl Claudia celebrate her quinceaÒera. Claudia, second from right, is sponsored by Harvey and Linda Correia, also pictured. 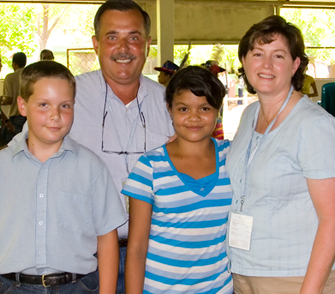 This picture was taken in 2009 when the Correias and their son, Michael, left, visited Claudia in Nicaragua on a CFCA mission awareness trip. My wife, Linda, and I began our family relatively late so when there was a CFCA presentation in our parish while Linda was pregnant with our only child, Michael, we liked the idea of expanding our family through sponsoring a young child. We sponsored Claudia, a 17-month-old from Nicaragua, in August 1998 when our son was 6 months old. Although we were not especially active sponsors in writing to our sponsored friend, we treasured the letters received, first written by an older sister and, as Claudia grew older, from Claudia. We did pray for Claudia and her family in our daily prayers, and this helped strengthen our bond with Claudia as well as help teach Michael our beliefs in social justice. The annual photos have been a great treasure and formed a great album showing Claudia’s progress.